However, pure Sn perovskites are extremely unstable, quickly losing their single crystallinity and degrading into inactive phases on exposure to air in less than five minutes. Now, Qing Shen and colleagues at University of Electro-Communications, Tokyo, report that alloying CsSnI3 nanocrystals (NCs) with CsPbI3 significantly improves the phase stability of the Sn perovskites. The alloyed CsSn1-xPbxI3 NCs (particle size 10~15 nm) were synthesized using a scalable hot-injection method recently developed by Shen et al. where a mixture of SnI2 and PbI2 is dissolved in trioctylphosphine and rapidly injected into an octadecene solution containing Cs precursor at 120 to 170 °C. The reaction was allowed to proceed for approximately 5 s, after which it was rapidly cooled to room temperature. The resulting NCs were precipitated with methyl acetate and redispersed in hexane. Notably, the resulting phases of the alloyed NCs can be stable for months, and far more superior to the parent CsSnI3 (< 5 minutes). 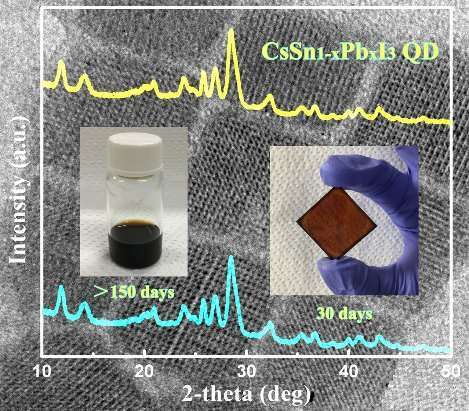 The successful synthesis of these stable Sn/Pb perovskites opens up new opportunities to improve the stability of other amazing but susceptible perovskite materials, and further expands their possibilities for practical applications.